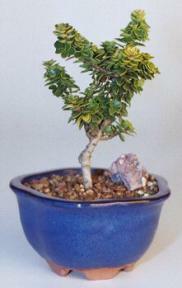 A charming miniature evergreen tree with tiny round leaves and occasional small black fruit. It has very short internodes, so the foliage is especially dense. Extremely slow growing. Hardy. Keep outdoors.